These are my legs, at age 33, living in the center Mexico City, a beautiful, crazy, polluted, but not too polluted to see the sky, busy, noisy, culturally rich, spiritually and seismically active city. I really wanted to write this on someone else, but it just didn’t work out with the timing. And since I post an official new episode for Skin on Sundays every Sunday, something had to be done. I love being my own canvas too, at least. This poem arrived like a spaceship hovering at first, perhaps the way that many things are realized at first. The answers to our questions, the solutions to our problems, the ideas we are looking for, they often come by simply by letting go of our inhibitions. Creativity certainly does not run on inhibited thoughts, so when we suppress the wild ways our minds might wander, or we don’t let our minds wander, it can be easy to feel in a creative rut. Letting ourselves imagine things, on the other hand, allows us to bring them into existence. People use the phrase “think outside of the box,” and that is essentially what I am referring to here, outside of the box thinking. I think the easiest way to think this way is to open up patterns of associative thinking to a more expansive realm. For instance, people say, “they’re like apples and oranges” to express that two things are very dissimilar. However, apples and oranges aren’t that different in the grand scheme of things (they are both fruits!). Saying, “they’re like apples and cameras” is closer to the kind of thinking patterns that are helpful to creativity. Even closer would be, “they’re like apples and obsession,” because now you are comparing a concrete living object to an invisible, abstract feeling. Metaphors, much like the one in the poem, help us to better understand the world, and the more accurately they represent the actual idea or thing that are trying to represent, the more successfully people will understand and make + feel the connection. I think that's one of the reasons I love poetry so much. They are often full of astute metaphors/analogies that make things that are difficult to comprehend at least a little bit easier, if not totally comprehensible. What does this poem mean to you? What do you think it is saying about the power of imagination? 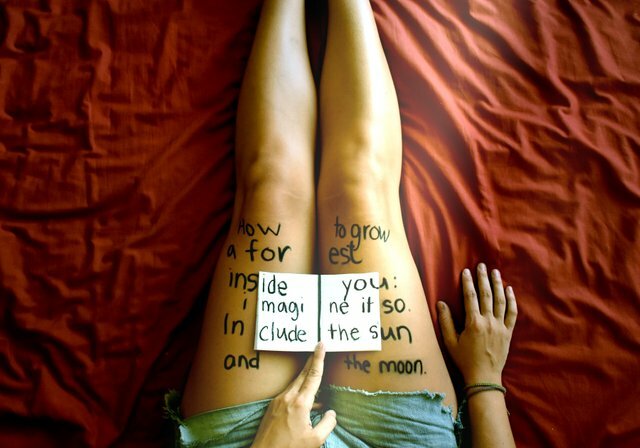 What about the part about the sun and the moon—how does that connect? Why would including the sun and the moon be important? Is there a larger metaphorical context at work here? How might it relate to your own experiences and situations? The mind is a powerful tool. More powerful than I think most people realize.